Perfect for day time or night time pizza eating. This pizza will leave you feeling creative and energized. Perfect for social gatherings. Take your best girl Mary Jane out for a slice and then finish the night with some Ice Cream. Leave Scarface and Brian at home. At Regents, every recipe begins from scratch with ingredients that we’ve committed ourselves to sourcing from the very highest-quality purveyors. Our relationship with Specialty Produce, San Diego’s best wholesale distributor, enables us to get the freshest seasonal fruits and vegetables to enhance our menu. We also buy from a variety of smaller, specialty producers to guarantee that we are working with the best of the best. Our pizzas are made fresh daily using Grande Cheese, which is the product of milk from small dairy farms in Wisconsin. Everything about the production is highly regulated, down to the acceptable pH range. This translates to big flavor that is consistently exquisite. The chicken we use in everything from our pizzas to pastas and salads comes from Mary’s Free Range Chicken, a family-owned and operated farm since 1954. At the farm, the chickens are ethically raised and served a vegetarian diet without added hormones or antibiotics to bring you the healthiest product available. Our Italian-style pepperoni is the work of Molinari & Sons, a San Francisco-based fine charcuterie purveyor providing traditional, old-world style quality salamis and sausages since 1896. Molinari uses lean pork and a special blend of spices, resulting in a richly complex flavor profile which lends itself beautifully to pizzas and beyond. We get our authentic Italian sausage from Marisa Foods, which has been a Long Beach, CA staple since 1947. They are meticulous about using lean, fresh meats and the best spices to produce premium quality products with a history of excellence, and their sausage lends itself perfectly to both our Chicago and New York-style pizzas. Finally, our selection of sandwiches are served to you on bread handcrafted daily at Bread & Cie, the first artisan bread bakery in San Diego. We can taste the difference, and we’re sure you can too! Our thin foldable-crust hand-crafted pizza, with hand spun dough baked in our stone-deck oven. Your choice of any 2 slices or 1 slice and a side salad w/ a beverage at a $0.50 discount. Made to order with our rich New York dough. Served with a side of marinara. Thick, hearty, stuffed-crust pizza. Two layers of dough, tons of cheese, sauce on top and baked to perfection. Call ahead - these suckers take about 45 minutes to cook. Our burger patties are made from a combination of Certified Angus Beef Ribeye Steak, CAB Chuck and Molinari Pancetta. Burgers and Sandwiches served with your choice of Truffle, Garlic or Straight Kennebec Fries. Always freshly homemade, never frozen. Call us and see...we’re always experimenting! Join us this Friday, January 11 from 11AM - 11PM as we're invaded by Societe Brewing. SDBW 2018 - Are you ready? Join us in celebrating San Diego Beer Week! We've got some amazing local craft beers available for you, so you won't want to miss it. Are you ready to come join our team? We're looking for talented and motivated people to be a part of our family! Spend your Valentine's Day eating the food you love with tshe person you love! Join us in celebrating the best food on the planet for a whole week! The Super Bowl is coming up fast and what better way to celebrate with our football inspired specials. Like FREE STUFF?? Join the club! Food. Gift cards. Sweet swag. The possibilities are endless when you join the club. Give the Gift of Pizza and Beer. Let's get serious about what people ACTUALLY want. Regents Delivery: Let US come to YOU. Why cook when you could NOT cook? Tag your pizza adventures on Instagram for a chance to win a $50 Regents credit! Explore our new menu of beer-friendly favorites, including a killer burger and gluten free pizza! Join The Regents Loyalty Program! You can be a card-carrying member of the Regents community! Enter the opportunity giveaway benefiting Camp Kesem UCSD through May 29th for a chance to win! Regents and Modern Times Beer partner to host epic beer event. The latest weird, wonderful and hard-to-find bottled brews hand-selected by Regents bartenders! Join us this Friday, January 11 from 11AM - 11PM as we're invaded by Societe Brewing. Featured beers include: The Shrew, The Bachelor with Strata, The Apprentice, and The Pupil. With any purchase of a Societe beer, you'll receive a FREE pint glass (Limited to one per guest and while supplies last). When you join the Regents Loyalty Program you'll earn an immediate 100 points (that's $5) plus 1 point for every dollar spent moving forward, so dining with us is basically an investment in your future! Become a member on your next visit or simply join online here. Your stomach (and your wallet) will thank you later. And don't forget that every month we'll be offering a special members-only promotion that automatically registers in your account. Free appetizers, dollar beers, and more - it's our way of saying thanks for being a valued Regents customer! Our system resets every Monday, so there's always time to get in, and cash in. Now the gift just keeps on giving. Regents gift cards are the perfect (i.e. not lame) holiday present! For every $25 spent, get $5 back! Always available in any dollar amount and great for pretty much everyone ... plus if you give enough of them maybe someone will buy you dinner? That's called a win-win, if you're asking. You can even purchase them with your Loyalty Program points, if that seems like the move. So next time you need something that says 'Hey, I really want you to be happy and full of the most delicious things in life', come see us! Life comes at you fast. Fortunately hot pizza, wings, fresh salads and all kinds of other delicious things can, too. Order Regents delivery or catering and let the best meal of your day simply show up at the door. Call 858-550-0406 or order online here. If you&apos;ve been in recently you probably know that we rolled out a brand new menu design last month. We now have some fresh boxes to match! Thanks to our incredible designer Rachel, they&apos;re the perfect reflection of all the things we stand for - look closely and you&apos;ll see a variety of quality ingredients, our NY-style Statue of Liberty, the Chicago &apos;Bean&apos; to represent our Deep Dish, and some beer glasses because . . . well, duh. So now that these babies are here and ready for action, we want to see what you do with them! Not only are they great coloring pages for the kiddos, but we happen to think that they&apos;re classy enough to take around town. We&apos;ll be sharing your most creative shots on our feed, and at the end of each month we&apos;ll choose a favorite. that&apos;s a $50 credit to use here at Regents! We can&apos;t wait to see where your pizza adventures take you! Sour dark ale aged in cabernet barrels for 4 to 8 months with black currants. Rich flavors of chocolate truffle, spice, tobacco, currants and a bit of Cabernet. Very full-bodied, sip slowly! Imperial stout aged in oak bourbon barrels with cinnamon, cocoa nibs, chilis and vanilla beans. Fragrant and intense, like a Mexican hot chocolate party on your palate. Strong ale aged in bourbon barrels with coffee and cacao. We&apos;ve finally put the finishing touches on all the delicious things we&apos;ve added for your dining pleasure. Not only is the menu itself completely redesigned, but we have 18 new items that are definite crowd - and palate - pleasers! So grab a pint, and dig in to your new favorite Regents options . . .
Finding a killer burger in the neighborhood is no longer a problem! Our patty is equal parts ribeye, chuck and pancetta, and with the BBQ Chipotle Bleu Burger you’ll also get BBQ and Chipotle sauces, Gorgonzola cheese and fried onion strings — plus our house made bacon! For the veggie lovers we&apos;ve added Buffalo Cauliflower &apos;wings&apos; and Tempura Fried Veggies to our appetizer selection, as well as hand cut Kennebec fries. For anyone with a wheat intolerance, our 10-inch gluten free pizzas are available with your choice of toppings, including our new Molinari & Sons specialty pepperoni or Marisa Foods sausage. We also have a newly curated selection of gluten-reduced bottled beer to guarantee that you always get the full experience! Our Gorgonzola Ribeye Salad is making it even easier to eat your greens, and the Fettuccine Primavera is full of locally-sourced seasonal produce. The Grilled Chicken Wrap is a great choice if you&apos;re looking for a lighter meal, but you can always substitute in our new pulled pork or bbq pulled pork for a richer flavor profile. As you can see, there&apos;s something for everyone on the new Regents menu (and this wasn&apos;t even half the list!) Come for lunch, come for dinner, come for a beer and a snack - whenever you get here, we want to know what you think. It&apos;s a season of change at Regents, but some things will always remain: our commitment to fresh and delicious food of the highest quality, and our desire for you to:﻿ Eat more pizza! Drink more beer! Be more happy! You can be a card-carrying member of the Regents community! Our customers are one of the most important parts of our business, and we want you to know how much we appreciate you! Create an account with us - either by picking up a card in-store, or by registering online - and you'll earn a point for every dollar you spend. After 100 points, a $5 credit is yours to use toward your next purchase. Membership rewards apply whether you dine-in, take-out, or order delivery, and your points & credits never expire. Fill out the form on our website, or call (858) 550-0406 for more information. Join the club! Get rewards! Be more happy! Want to get FREE PIZZA every Friday for a year? Come out to Regents every Friday-Sunday and every weekend through May 29th for your chance to win. All you have to do is buy a ticket for the opportunity giveaway benefiting UCSD’s Camp Kesem. By doing so, you'll be supporting children through and beyond their parent's cancer. Stop on by and together, let’s make a difference! To say this is exclusive is an understatement - DO NOT SLEEP ON THIS. 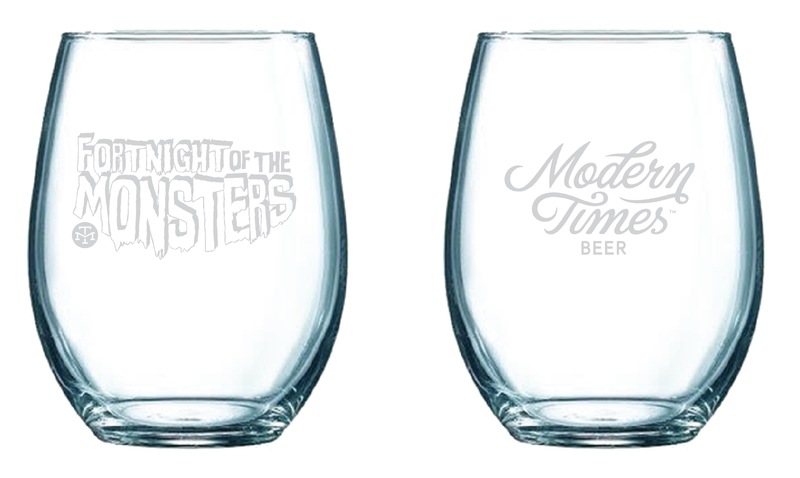 Commemorative glasses are available for $2 while they last, so get here early if you want a souvenir from the best day of your life. And as always, come thirsty. This monster waits for no man. It all began in 2005 when Stephen Carson purchased and became the 3rd owner of Regents Pizzeria. We’d like to say the rest is history, but there’s so much more to it than that. Stephen was a very talented chef with over 20 years of experience in casual dining concepts of all kinds. If you were to ask Stephen about his strengths, he would have immediately said that his talents lay in “comfort foods.” Well, what better comfort food than pizza, the world’s most popular food? Sadly, Stephen developed cancer and left us in 2011, but his legacy lives on. And what a legacy it is! Here, in the Regents Pizzeria family, we continue to take the craft seriously, just as Stephen would have wanted it. 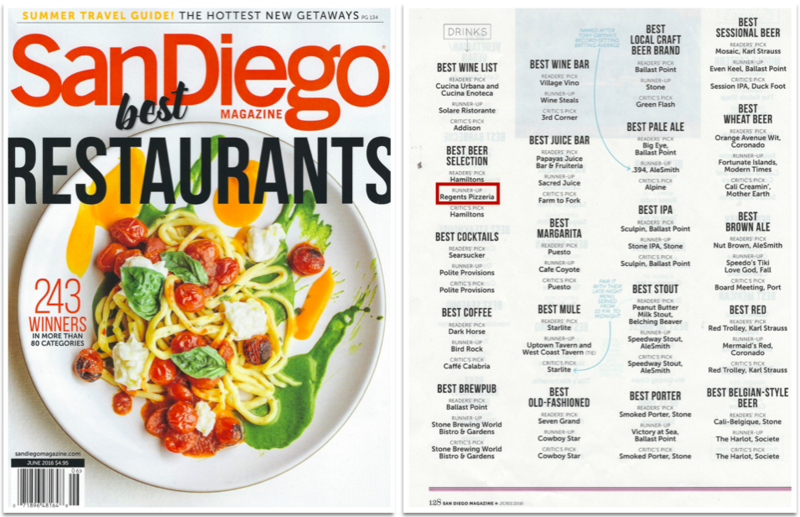 Every recipe was changed and changed again until it developed into the award-winning food we serve today. Every recipe is made from scratch, using the best ingredients available to us. We don’t own a freezer and never will. Our ovens and dough mixers are imported from Italy, simply because they produce the best possible crust. Believe it or not, we use San Diego tap water in our dough. Our water has a high content of minerals, which translates to a well-balanced dose of salt on your palate. And then there’s the cheese. We use only Grande cheese- the best we can buy. All of the milk in that cheese comes from dairy farms in Wisconsin and everything about the milk is highly regulated, down to the acceptable pH range. This translates into big flavor that’s consistently delicious. The cheese blend also incorporates a sharp aged provolone which adds a new layer of flavor. Our tomato sauce is more acidic and “bright” because we use the highest quality tomatoes available and never use tomato paste as some of our competitors do. Even in New York! That’s saying something. So really, if you could taste test a true NY pizza side by side with a slice from Regents, you would find that the one from our East Coast neighbors would taste much blander. So much for NYC water! Our Chicago style pizza is patterned after one of the best pizzerias in the Windy City. We just made it better. Of course, it has the same great “flavor bomb” qualities that you will find in our NY style. We also put our sauce on in the last 10 minutes of the baking process so it will not soak into the top crust. Oh, and that sauce is hot when it’s poured on, unlike the Chicago standard. We also have a great appetizer list. As with our pizza, we take standards and improve upon them. Just taste our wings. The other guys take the heat up in their sauces by adding capsaicin extract. Not us. We change our heat varieties by adding different types of peppers. Our first level is Jalapeno with 9,000 Scoville units of heat, moving all the way up to Scorpion with a 2,000,000 Scoville unit rating. And here we are. One year in our new location and ten years of spinning and handcrafting pies in total. Come on over and order a tasty craft beer to go with your pizza. We have 32 taps with a consistently rotating selection that will bring a frothy grin to the most discerning San Diego beer expert. Of those taps, 28 are traditional, two are nitro and two are cask conditioned. We had to do it. San Diego is the Craft Beer Capital of the Universe and we’re proud to be part of the movement. So sit back, drink up, savor and enjoy. Or as we like to say – Eat More Pizza, Drink More Beer, Be More Happy. No card? Create an account. Regents Pizzeria (“Regents”) is committed to facilitating the accessibility and usability of its website, regentspizza.com, for people with disabilities. Working with a retained accessibility consultant, Regents will be implementing over time the relevant portions of the World Wide Web Consortium’s Web Content Accessibility Guidelines 2.0 Level AA (“WCAG 2.0 AA”) as its web accessibility standard or other standards to the extent required by the Americans with Disabilities Act (“ADA”). Our website will be tested on a periodic basis with assistive technology such as screen readers and screen magnifiers, and with users with disabilities who use these technologies. Please be aware that our efforts are ongoing. If, at any time, you have specific questions or concerns about the accessibility of any particular webpage on regetnspizza.com or any of our destination websites, please contact us. If you encounter an accessibility issue, please be sure to specify the particular web page in your email, and we will make all reasonable efforts to make that page accessible for you.